U.S. Congressman Salud Carbajal joined celebration of rental development for farmworker families. 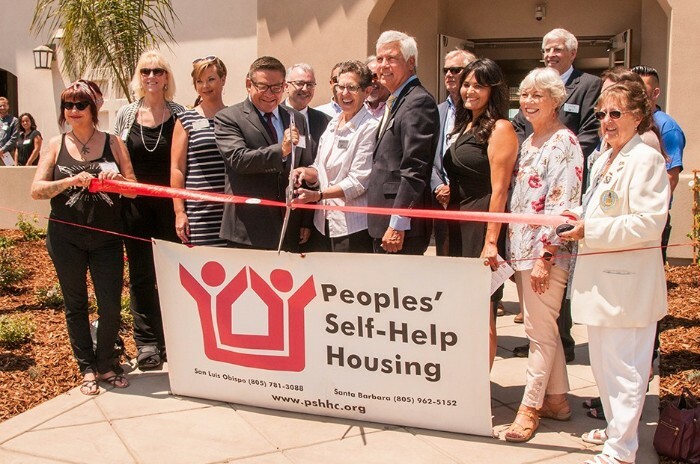 Santa Maria, Calif., August 7, 2018 – With the help of some 120 residents, project partners, community supporters and elected officials, Peoples’ Self-Help Housing (PSHH) celebrated the grand opening of Los Adobes de Maria III (LADM III), new affordable housing for farmworker families in Santa Maria, on July 27, 2018. LADM III, located at 525 South Russell Avenue, features 34 units with environmentally friendly and energy efficient systems plus a community room, on-site laundry facilities, barbecue area and a children’s playground. LADM III is the third development phase of the Los Adobes de Maria community and offers adjustable rent for farmworkers and their families earning less than 60 percent of area median income. Residents at all three developments will benefit from the site-based educational programming available at the LADM II learning center which includes after school tutoring for grades K-8 and support for those bound for college. Adults have access to work force readiness programs, career and small business development. LADM III is PSHH’s first Leadership in Energy and Environmental Design (LEED) certified development as awarded by the U.S. Green Building Council. LEED is the most widely used rating system in the world and provides an international standard in the development of environmentally friendly buildings. Funding agencies for LADM III include Wells Fargo Bank, County of Santa Barbara, City of Santa Maria, USDA Rural Development, National Equity Fund, U.S. Department of Housing and Urban Development and NeighborWorks America. Development partners include Carl Schneider & Associates, Peikert + RRM Design Group, Landscape Architect Robert Andrew Fowler and Interiors by Adele. View events photos at www.pshhc.org.